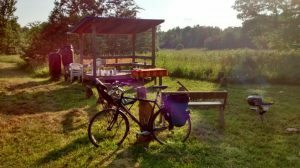 Hearts Ease: In 2016 Anthony set to work on what would come to be known as Heart’s Ease, a charming structure nestled in the woods between two fields. Construction began at his home, and soon thereafter, the pieces were assembled on the land. 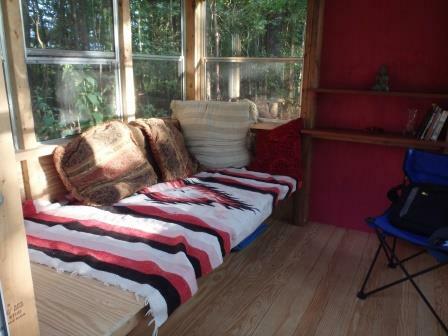 After its completion, we were all excited to have a new cozy forest retreat space. 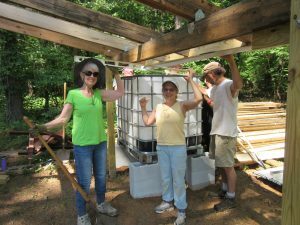 Pump House: After getting a well and pumps live on the electrical system and powered by solar panel, we needed a pump house! 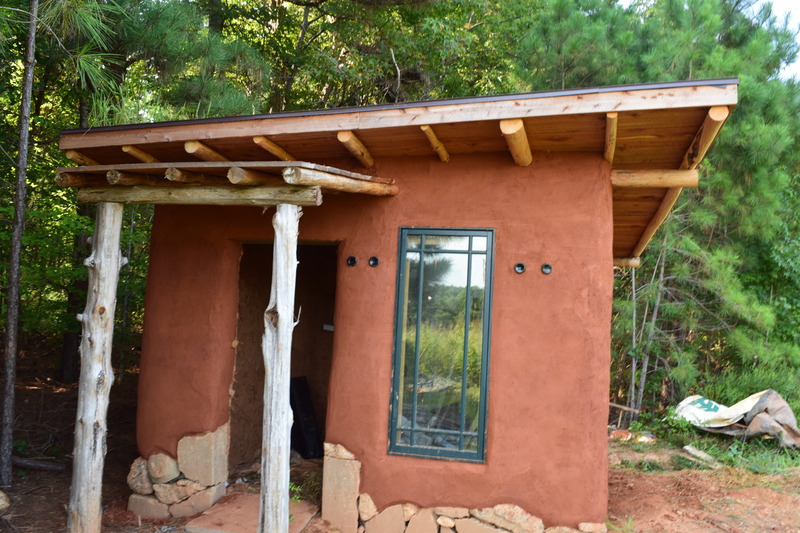 Anthony drew up designs, and with the help of Greg Allen and many volunteers, it was constructed and slipstraw (which must dry for days) was added just in time for Hurricane Florence! Luckily there was time to wrap the entire structure in layers of tarp, and in the end the rains and wind didn’t do the structure any harm. The plastic was removed, and the cob was able to successfully finish drying. Our pumps and their electrical system are now shielded from the elements with a colorful new installation! rt over the time since; and in Spring of 2016 we completed passable walkways all around the main chunk of the property. 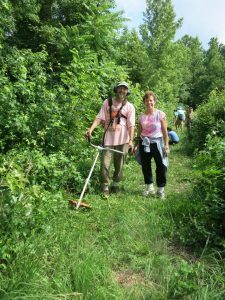 In the fall of 2017 we started forging trails into the southeast wetland and forest area. Varied terrain and woods and fields are included on almost a mile and a half mile of trail. Current trail work consists of maintenance and upgrades: clearing stumps, leveling the footway, and reorienting the trail to avoid damage to special wildflowers and fungi that keep showing up. For a trail map, click here. Beehives: For two summers, Randy cared for hives at Hart’s Mill. In the fall of 2014, we worked with the National Pollinator Partnership to obtain wildflower seeds and seed about 1/4 of an acre in plants that are beneficial for pollinator species. We tilled the land, planted the seeds, and put two beehives next to this “bee buffer” in April of 2015 as a step in exploring the viability and integration of honeybees into the landscape. The hives seemed to do well through the summer. In September, one o f the hives mysteriously perished overnight in a manner consistent with what has been experienced recently by many beekeepers- “colony collapse disorder”. The other hive made it through the fall but starved in the winter. 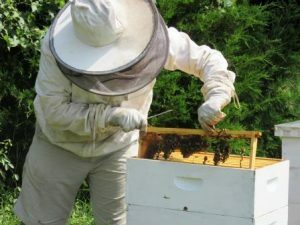 It appears as if warm temperatures in late fall/early winter resulted in an unnatural buildup and depletion of the hives resources so that all of the reserves were gone in February before the spring nectar flow kicked in. 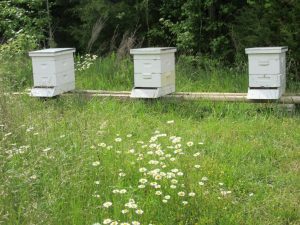 A message was sent around and the committed Harts Mill community pitched in in early 2016 to try again, this time with three new hives. These three hives also collapsed, but this time prior to the winter. As a result, we took a break in 2017, but picked up the baton again in 2018, with Tain and Randy starting two new hives, which, with a little coaxing, were doing well going into the winter. Once the weather warms in 2019, we’ll see how they fared. 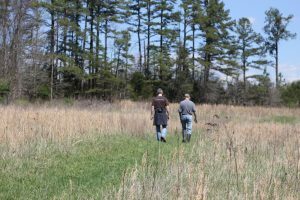 Village pathways: Last Fall we staked out the paths of the current site plan on the land and began mowing and where necessary clearing them (through the ailanthus slash field), so that members and visitors can begin to envision the actual village on the land. These are now even visible on Google Earth! Since the site plan may be adjusted, we may be clearing new paths soon. 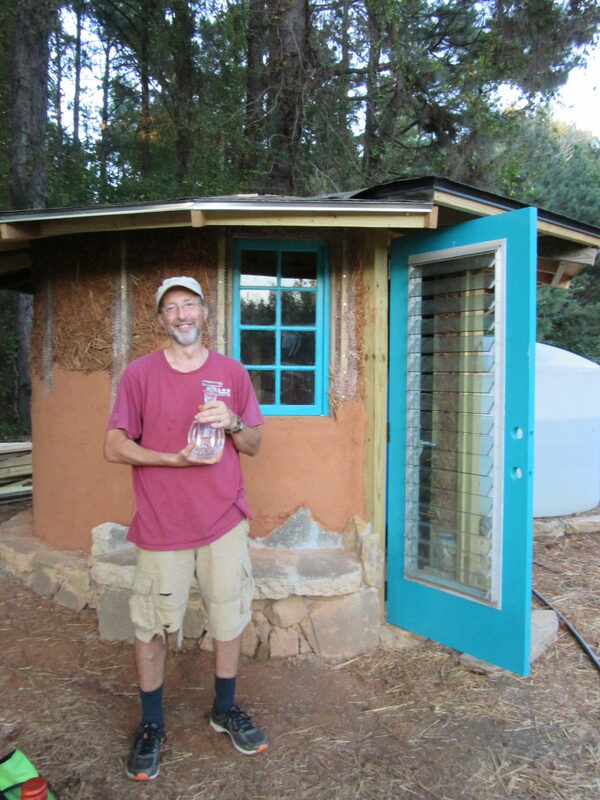 Water: The shed is about 400 square feet of roof that drains into a 300-gallon storage tank that in turn is piped 250 feet or so the garden, where we have set up a bright red hand pump so that gardeners can easily pump water for the plants. We also have 100 gallons of water storage at the Pavilion. Now we are fine-tuning the tank and pump system. Vegetable garden: This year’s garden features tomatoes, carrots, pole beans, and herbs. Thanks mainly to Carol and Paul, the soil has been enriched with plenty of compost, biodynamic and other soil amendments, and straw to keep the weeds down. Carol conducted an experiment contrasting biodynamic and organic approaches and how they affect production across a number of factors. We look forward to seeing her results soon. In the meantime, we’re sure enjoying the tomatoes! Field maintenance: As the land comes under our active management and the ecologically draining farming has ended, we also need to keep the meadows somewhat open while considering habitat for small field animals and insects as well. 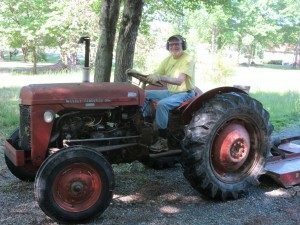 We have bush-hogged most of the east meadow and now keep it mowed down for community activities, while following a schedule and establishing a plan for bush-hogging the rest (west meadow and Far Field) in sequence over several years. 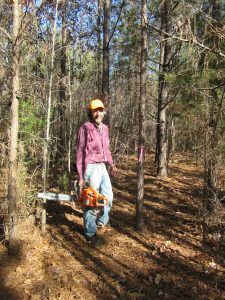 Forest maintenance: We inherited a Forest Stewardship Plan, funded by the Eno River Association, from the previous landowner. Over the past several years, we’ve sought input into implementation steps from two forestry consultants, including one specializing in horse logging. Where we are currently with this work is pursuing, on our own, a very deliberate thinning of a few forest stands with the most immediate needs for attention. We’ve coined this initiative the “Wood Wide Web” project. 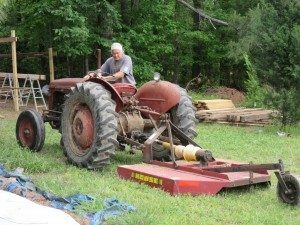 Maintenance at Frazier Road: We maintain the lawns on the old Kim V. property adjoining Frazier Road, including the old house site, and in general try to meet the neighborhood aesthetic where our main entrance road will eventually go.